Journalists are so caught up in the debate over Facebook’s news algorithm they have forgotten there’s more to journalism than getting your content seen. On October 9, Mathew Ingram wrote a post titled “A tip for media companies: Facebook isn’t your enemy, but it’s not your friend either.” The article was a reaction to the debate stirred by an ONA panel where a roomful of journalists expressed their frustration in the opacity of the news algorithm to Facebook’s head of news partnerships (and respected social journalist) Liz Heron. Ingram’s reminder that Facebook is a tool for journalists is a good one, but even then Ingram doesn’t elaborate how journalists can be using it as a tool. The debate around the Facebook algorithm today is all about promotion, and little about actual journalism. So why isn’t anyone talking about the intrinsic value of the platform as a news tool? I’ve found that the vast majority of journalists complaining about the Facebook algorithm don’t understand that it is more than a promotional vehicle. Facebook is a vast repository of stories from around the world, a massively powerful search engine and source-machine. Facebook has, in the past six months, come up with some easy ways for journalists to find these stories. With their new media page, Newswire Facebook page and Trending topics feature, Facebook is trying to demonstrate that is it relevant as a news-gathering tool. 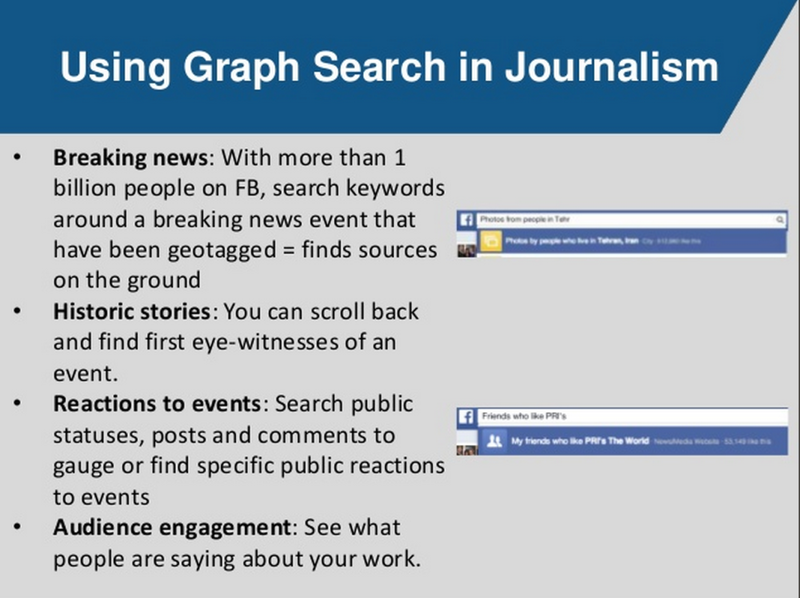 But these efforts pale to the potential impact of Facebook’s greatest journalistic tool: Graph Search. 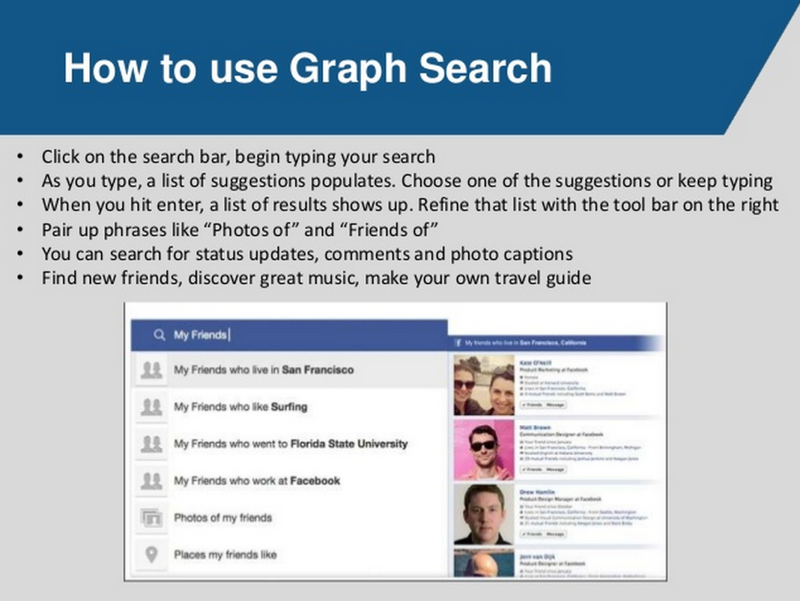 When Graph Search launched in March of 2013, not many people noticed. The biggest impact it made was on people who had something to hide that had not locked down their privacy settings properly (see the hilarious Actual Facebook Graph Searches Tumblr). Facebook made an effort to show people how the new search bar worked, but that effort failed to reach the masses of journalists who still turn to Twitter to find stories and reach out to sources. When it launched, Mark Zuckerberg called Graph Search, Facebook’s search engine, the “third pillar” of Facebook, along with the news feed and timeline. If you don’t think Graph Search is that useful, it might be because you’re not using it right. 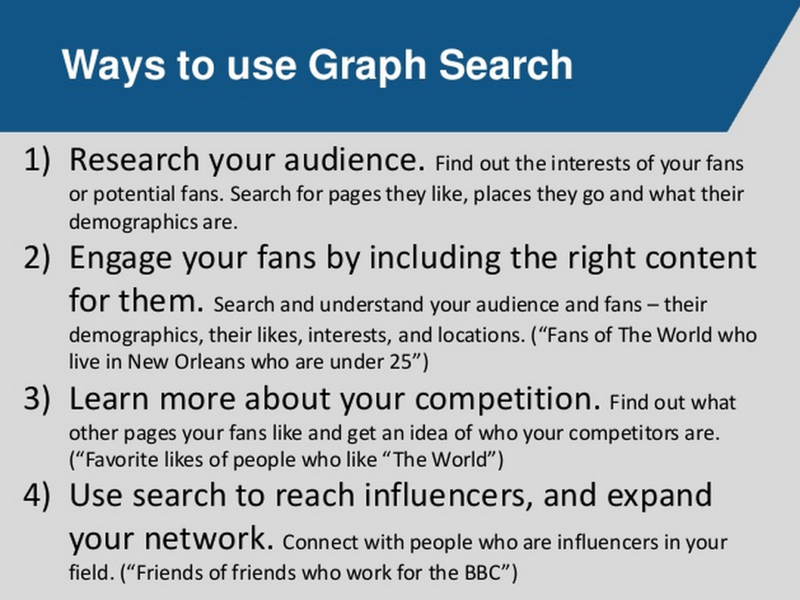 Graph Search is designed to search with the user’s natural language, not just by keywords as we’ve been taught by Google. Below are some guides I’ve put together for my newsroom that explain why journalists can and should use graph search and how to use it in story chases. Bottom line, journalists need to stop worrying so much about the distribution and promotion of their content and focus instead on the opportunities this free platform can offer us to enhance our reporting. For more information on Facebook privacy and graph search for journalists, see my “Facebook 101 for WGBH Employees” presentation on Slideshare. Director of Social Media at @WGBH in Boston.